Currently when you are having a chat with Siri, the voice dictation audio is encoded and transported to Apple’s massive data servers for processing. The result is then determined and transmitted back down the data connection and replayed on your device. This is why Siri doesn’t work without data. That may all be about to change if recent findings are anything to go by. According to a string of code found in the latest iOS 7 Beta 2firmware, it appears that Apple is testing a local offline version of voice dictation for iOS devices, removing the data dependency of Siri. 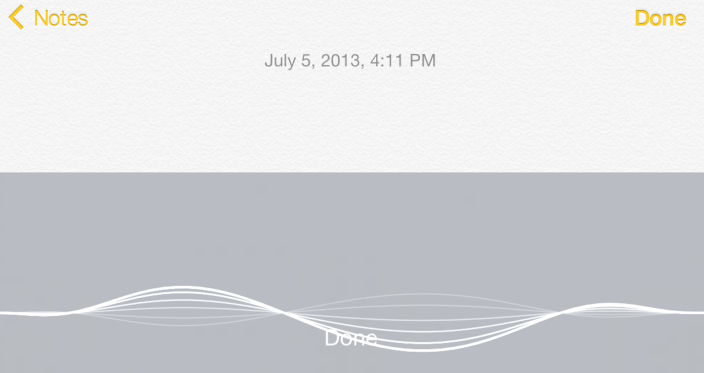 The code that has been found inside iOS 7 was not present in iOS 6, suggesting this offline dictation is a new feature looking to be implemented in iOS 7. Relying on an Internet connection for voice dictation can be troublesome when that data connection isn’t available. It leaves a powerful feature like Siri completely out of action, which is a shame. However, with the testing that Apple is conducting, it would allow the iPhone, iPad, and iPod Touch to process and convert speech right on the device itself. This would also make loading the results and interaction alot quicker and smoother. Although the functionality is not public-facing yet, or even open to Devs in the latest Beta 2, sources say the offline dictation is already up and running for Apple testers back at their campus, suggesting the functionality is in the final stages of testing. Source have also speculated that the offline dictation could be a configurable option, with users being able to opt for maintaining the data-driven results. Perhaps this would offer enhanced functionality for real-time data that simply cannot be maintained by an offline version. This is an extremely exciting feature that will hopefully get released to the public soon. Porting the functionality to Siri would definitely be a welcomed addition, and make the search-assistant far much more useful. Let us know what you think in the comments section below.